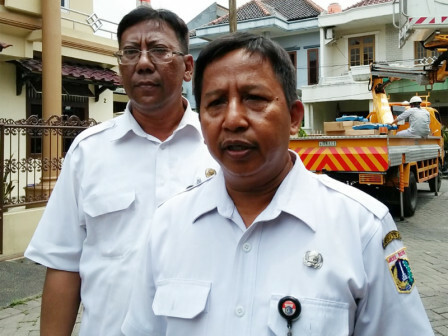 14,328 LED smart system (SS) installed in five East Jakarta sub-districts. This installation is done from July to August 31.
" Total 14,328 LED SS lamps are installed in East Jakarta with capacity of 40 watts and 90 watts"
East Jakarta Industry and Energy Sub-dept. 's Monitoring and Handling Section Head, Maryono stated, LED SS installation is done to replace existing HPS lamps with 250 watts. "Total 14,328 LED SS lamps are installed in East Jakarta with capacity of 40 watts and 90 watts. It is installed in five sub-districts and we still continue to install it gradually," he informed, Friday (9/7). There are 13,097 lamps with 40 watts voltage from total LED lamps installed. 3,786 lamps are installed in Pasar Rebo Sub-district; 3,654 lamps in Ciracas; 3,645 lamps in Kramat Jati; 194 lamps in Jatinegara; and 1,818 lamps in Duren Sawit. While 90-watts LED lamps are 1,231 lamps in total. 463 lamps are installed in Pasar Rebo, 495 lamps in Ciracas, 15 lamps in Kramat Jati, 75 lamps in Jatinegara, and 183 lamps in Duren Sawit. "The problem is we need more time to remove the previous lamps because most of HPS lamps are rusting since it have been used for 15 years in average," he conveyed.